Lovely early Victorian mahogany child’s chair. SKU: 4827. Category: Other Chairs. Lovely early Victorian mahogany child’s chair. 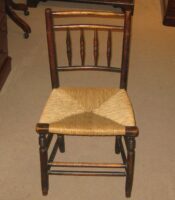 With bergere caned back and seat and with an upholstered cushion. With turned front legs, stretchers and a removable safety bar.